Posted on Tuesday, June 11th, 2013 at 2:37 pm. 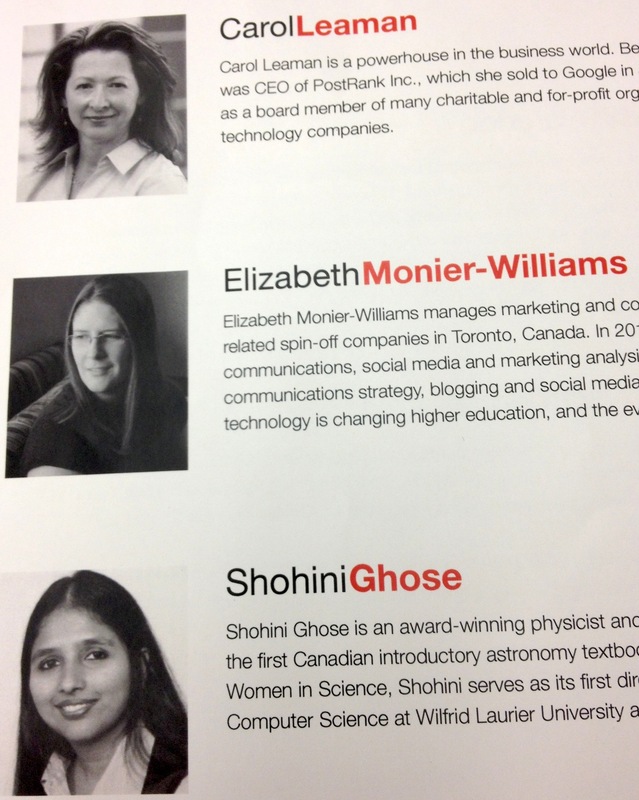 Speaker photos from the TedxWaterlooWomen program. I was impressed by Shohini’s and Carol’s presentations and enjoyed meeting them. Not shown is Jon Corbin, who wowed the audience with his spoken word poetry. I gave my TedxWaterlooWomen talk on December 1, 2012. My topic was Having it all: Why we need better stories about female superheroes. It was a fantastic event. I delivered a talk I’m very proud of and received some excellent feedback from those in the room and online. I got to meet the other fantastic speakers: Professor Shohini Ghose of Wilfrid Lauirer University, Carol Leaman of Axonify, Jon Corbin (The Runway) and our gracious host and MC, Julia Rosien. Afterward, I had some great conversations with people in the audience and on Twitter. My spouse was in the audience and it was really special to share the day with him. For background on my previous Tedx experiences, here’s the post I wrote when I was confirmed as a speaker. UPDATE (August 2013): I hope to have the video soon. I’m told considerable progress has been made in the preparations. Fingers crossed! Many of my friends and colleagues were extremely supportive during my five weeks of intense preparation. As I’ve run into them over the last six months, they’ve continued that kind support by asking how it went. And then they ask when they can see the video. I wish I had a clear answer to that question, particularly in light of the whole conversation happening around Sheryl Sandberg and the Lean In movement. But, as I’ve spoken about previously with my former colleague Bob McKenzie, audio capture is one of the most crucial part of video production. If you can’t hear what’s being said, the video footage is next to useless. I’m told the TedxWaterlooWomen audio files need a lot of work. I believe the organizers are perusing every possible avenue to get the footage cleaned up and ready to be shared online. I hope to share the video with you soon. I’m so proud of you, my former officemate. You were always the one to watch. I want to see the video too!